Every day, people check in to a hotel and check out. 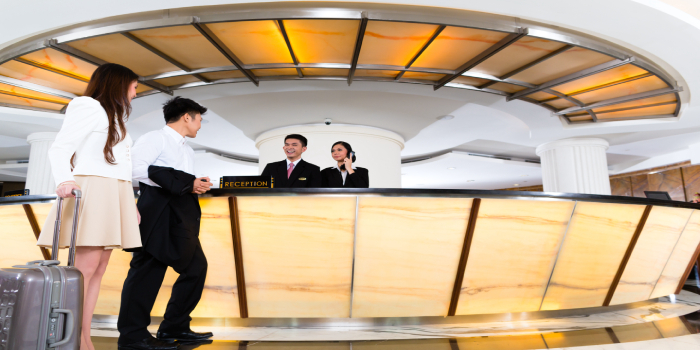 A concierge is the one who caters to every request in between. From arranging transport to making restaurant reservations, to recommending the best shopping and nightlife spots, or planning local, authentic experiences for travellers, a concierge is the go-to person for a guest’s every need. Whether it’s a last-minute call for a private jet to Mumbai or a simple cab booking to the airport, requests come in different forms. You will never hear a ‘no’ from a concierge unless the demand is on the wrong side of the law or unethical—this is an unspoken code among the tight-knit community of concierges across the world. “Being a concierge is a most unique service. Sometimes guests say ‘concierge’ is a synonym for ‘Google’ because we solve difficult tasks in simple ways!” exclaims Beethika Pramanik, Concierge Supervisor, Shangri-La’s Eros Hotel, New Delhi. “It’s a challenging job, it’s nothing like a regular, clerical job—every day is new and exciting. You get to meet people from different countries and cultures. This job has helped me learn a lot of new things every day,” says Pramanik. Keeping a cool head, pleasant demeanour and positive attitude brings out the best in you. To be a concierge, you have to have a zeal for it. In the initial stages, a concierge should be prepared to put financial aspirations on a hold. Once you prove yourself, there are many opportunities, and the rewards are handsome. In a hotel, you will see guests from all over the world. It becomes important to understand world culture, and recognise that different people need to be handled in different ways. Spaniards, Japanese, Britons or Punjabis—no two people are the same. It is the job of a concierge to understand every guest and their unique requirements and come up with personalised, tailor-made solutions. Unlike most professionals who are constantly vying to better the other, the beauty of being a concierge is a boundless sense of commitment to the service. Loyalty lies with the trade, not the title or hotel. In fact, concierges across the world work together to ensure their guests have a pleasant experience wherever they are. Being a part of an international association like Les Clefs d’Or or ‘The Golden Keys’ provides a strong platform for networking and opportunities for career growth. The Indian branch of the international organisation was founded by Mr. Edwin Peter Saldanha, who is currently Head Concierge at The Lodhi, New Delhi. Out of 135 members of Les Clefs d’Or India, only seven or eight are women. “Being a girl, it’s been difficult. The job profile of a concierge is male dominated. But, I manage!” beams a determined Pramanik. It’s tough to make it in a man’s world, but confident young women like Pramanik are proving themselves more than competent to deal with the challenges of the trade. This is encouraging for young girls taking up hotel management today to consider a compelling career as a concierge. Careers360 brings here an exclusive interview with Edwin Peter Saldanha, who is the Head Concierge, The Lodhi, New Delhi, President, Les Clefs d’Or India. Q. What do you look for when you hire a concierge? A. He/she has to be outgoing, a good listener, and have knowledge about the surroundings—the hotel, city, state, country and the world. If they have these three qualities, we can groom them for bigger things. A hotel management degree is favoured, but not a must. We make exceptions when we see potential. Q. What is the biggest challenge on the job? A. Every other department in a hotel plans its day. For a concierge, there is no way of knowing how the day will pan out. Every day is different. The best way to handle that is to clear your backlog and be ready with a fresh mind for the next task. Q. Possible pathways for career growth? A. Every hotel will have only one position for a Head Concierge. So, most concierges start looking at other departments. Youngsters nowadays can look at five to ten years as concierge and then moving up. Many friends, who started with me as a concierge, are now General Managers. India’s hospitality industry is ever-growing. If you work in the hotel industry, it’s very easy to get a job anywhere else, especially in the customer industry. Q. What is the most exciting aspect of being a concierge? A. We have an international association of around 4500 concierges called Les Clefs d’Or, which means ‘The Golden Keys’. In India, there are about 80 hotels and 135 members. Anywhere in the world, you’ll find these keys in the best hotels. I’ve travelled to 37 countries for meetings, trainings and more. For me to remain as a concierge, this has been the number one reason.